I have a Samsung Note 2 running 4.1.2. Google recently updated Google Play and now does many of their basic function updates through Play instead of through Android releases. Since this has happened I now get unasked for and unwanted Google Play ads for aps that appear on their site randomly popping up on my phone - not from within running apps, but just on the phone itself. There seems to be no way to stop this callous disregard for Google customers' privacy and personal space. Why do they imagine that doing such things will make me want to respond to their advertisers. It makes me disregard the ads entirely. This policy is good for no one, customers, advertisers, Google or Android. I don't mind ads appearing in free apps - that's why they are free, that's fine. But I didn't ask for this intrusion and interference when I bought the Android operating system on my phone. These ads interfere with running apps, like the phone app, or the alarm app. Google Play opens itself whenever the phone comes out of hibernation and displays a random app from the store, asking you to install it. When my alarm app goes off in the morning, instead of the screen with buttons to snooze or dismiss the alarm, I get the Google Play screen. When I finally get rid of that, the Alarm is nowhere to be seen, not even in the list of running apps behind the pull down screen, yet the alarm sound continues to go off the whole time. I have to go find the Alarm icon and open it again to turn the alarm off. THIS IS AN INFURIATING example of the way Google treats their users. There seems to be no way to turn these Google Play ads off - Google Play is no longer an app and you can't treat it like other apps. There is no way to complain about it to Google. The Contact Us tab on the Google Play site is a joke and doesn't work. HOW DO I GET RID OF THESE ANNOYING AND INTERFERING ADS? Canyoner and rickejjt like this. I've literally never seen that happen and suspect something is wrong with your device. Not only have I not seen it, but it completely violates Google's advertisment ethos. The only thing similar I can recall are apps that used to install shortcuts for other apps and push notifications to the device, and I consider both of those things, along with what you're describing, to be malware. Do you have any sideloaded apps or apps from third party app stores? How long has it been doing this? Can you take a screenshot of the ads? If there is a notification, you should be able to long press it and get an option for "App Info". Press that. What app is that? If it's something you don't recognize, press "force stop" and then "uninstall". It is not an app doing it, it IS the Google Play store doing it. No I have not downloaded a viral app. No it is not something wrong with my device. How could my phone cause that by a fault with the phone? The only apps I have come from either the Google Play store or Samsung or my phone company. It only started since the last Google Play update. The last ad that came up, just a minute ago, opened a Play Store window at a game called Marvel War of Heroes, but it has opened it at other apps also. There are no notifications. Its deff a rouge app. Try reinstalling your is. Take a screen shot next time? Okay, well that is behavior that does not resemble anything the Play Store has ever done on any single device that I have handled or heard of. What you are describing is behavior typically linked to downloading "fake" or malware apps. It is possible to get apps like that from the Play Store, but they're rare. If you do not know what is wrong, how do you know that nothing is wrong? If nothing was wrong, we wouldn't be trying to troubleshoot what is wrong. This is an obvious case of malware, or a bug. Below are the solutions to either, including how to test if it is actually the Play Store update. If it is the Play Store, then it should stop if you roll back the update. That can be done by opening the app and hitting "uninstall", which will prompt you to uninstall updates restoring the factory version. If that makes the behavior stop, then you can try to update it again and see if the behavior resumes or is gone. If it is not the Play Store, then it will continue after that and the solution will be uninstalling the app that is causing the behavior. The second case is about 970% more likely, but you can easily test it to see which it is. If you're unable to locate the app, then a factory reset should solve it, but you'll have to decline the "auto backup" option at startup and then manually install each app. If that ends up being what you do, then be very careful about installing each app, watching for bugs like this with each one. What the OP describes is not unlike what my wife tells me started happening to her Galaxy Tab 2 after she last updated to 4.2.2. I instead installed CWM and CM 10.1.3. I have experienced no such things. Okay, I will try that if the ads recur - I have just uninstalled an app from the Play Store called Cartoon Camera that I downloaded about the time of the Play update in case it is that, as the last time a rogue ad came up the Play Store app crashed and I got a system message saying that Cartoon Camera had stopped working did I want to report it. If the ads stop now I will know it is Cartoon Camera. If the still happen I will try rolling back the Play update as you suggest. Thanks for your help. (I misunderstood what you said earlier about it being a problem with my device - I took that to mean with the phone itself, but from your remarks here it seems you meant a problem with malware). so this is happening to me too. I truly believe that it is NOT Google, but some 3rd party that has somehow figured out how to open the play store and take me to some game app. Zynga games see, to come up most often. I have a Nexus 5. When to phone comes out of hibernation, Google Play Store opens to a game app. It is annoying, of course. I have uninstalled all the zynga apps that I had and it still happens. My guess is that it is related to some app I installed (and I may not be able to get it out without a factory reset). Hopefully someone can help so I dont have to go through that. Lookout Ad Network Detector is a free app & can tell you where the ads are coming from. Good luck. I tried Lookout and avg and a bunch of others. None were able to tell me anything useful. Ran all checks and clean ups and still the issue persisted. So, I had to take drastic measures. 1) manually backed up all pertinent files. 2) Deleted all unwanted apps. 3) Performed a hard reset also known as a factory reset Note: This is not for the faint of heart. Also, a hard reset can take 10-15 minutes, and it has no progress bar, so whatever you do, please let it take its own sweet time. 4) After the reset, google auto-magically re-downloaded all of my apps. 5) manually restored backed up files. Seems to have gotten rid of the problem. I really wish that I knew how the heck it got there in the first place. That is pretty drastic. Let us know if the issue persists or comes back. In addition to this post, I would highly suggest to replace apps slowly. In groups of three maybe four and run the phone for a few days. Then a few more apps. This helps pinpoint which app is the troublemaker, so it can be reported to Google. Not sure if anyone actually tried this. Yeah, pretty drastic, but also kinda cool. Like in the old days when you get to reformat a drive...... a:>Format c: lol. As for adding apps back, that is a great idea. Given that I deleted most of the un necessary apps, I am hoping that it came from one of those. NothingIsTrue, there was no notifications when it popped up. On a totally new subject, if you are a golfer then you should check this out: GAME GOLF Mine just came by Fedex today. Not much good for me right now, given it is January, and we have a tonne of snow on the ground -- lol. I'm also wondering what the score is with Google ads. Not from apps, just popping up from nowhere and taking over the screen. The info button identifies them as google. I've tried various ad removers but none seemed to prevent them. Driving us back to iPhones?? Mine is doing it to but only on a business phone. Not my personal one. Weird. The last time I went to my home screen and the ad was there, there was also was showing a message about smart charging or something like that. simply tap the icon in the top right corner and click DISABLE. I haven't had an ad pop up since. There is a current thread on Adguard. Read it! Ok i have had this on my phone for weeks and have been unable to get rid of this pop up comple screen ad that appears to come from Google play to instal games and geek shopping app mostly. I have a galaxy S6.To get rid of it go to settings, go to apps. It is discised as a system app with a green android next to it called, i cant remember for sure, it was something like (com.googleplayupdate). It will say the purrpose of this app is to turn off camera 🤣. Delete the app - problem solved. Have a nice day!!! This crappy Android!!!! How to stop this on my Note 8. I have deleted all the recent apps and it did not work! I have run 3 antiviruses one after another, and 2 ad scanners and nothing. Why the hell in principle Google allows this **** to happen. No add should be able to pop up!! Ok fine if I click on the app and it throws me to google play I understand... This is my click!!! But I do not click anything I just unlock my phone and see some **** from google play that it proposes me to install. Why? My privacy is in danger. I do not appreciate this at all. Noone else I can blame for this but for Google... or Samsung. They should not allow without clicking the app... any popups of google play! Please help how to correct this except for factory reset. Turns out to be a simple fix. I was getting the same full page ads. Most of the ads if not all would take me to the Google Play app to install the apps. I SIMPLY deleted the Google Play app on my phone and the problem was eliminated. You can still load any apps you want via the Galaxy app on the phone. I have the exact same problem with my redmi! Intrusive is the word!!!! 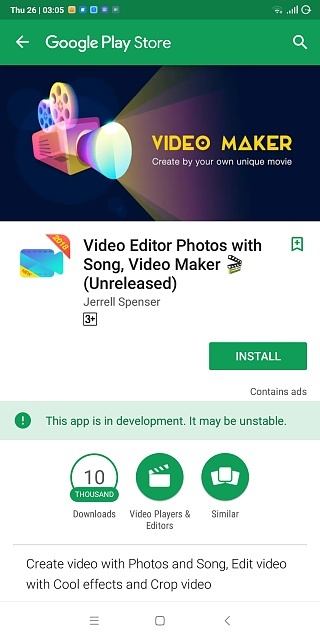 If we erase Google Play store, how can we install new apps? How can we remove this app that shows ads randomly and no exit botton too top it off at that..while modeling right at the center of the screen. Everyone claiming that they have some sort app causing the pop ups, or a virus, or anything else causing it, you are wrong. I have been experiencing these popups since buying my new LG V30 just a few days ago. These intrusive popups are straight from Google Play. On my phone, you have to go to settings, general, Google, ads, then select "opt out of personlized ads". Only problem is that it does not stop all the ads, just the personalized ones, and it even tells you that when you select to opt out. It is total bullcrap. I just had one of the bubbles pop up, I ignored it, then a full screen pop up appeared, which I had to hit the X to make it go away. There is no way to actually get rid of them with updated OS's from what I have found so far. T-Mobile Galaxy S II - Google Play and Facebook connection errors?